Our first "Row" was "The Story About Ping" by Marjorie Flack. 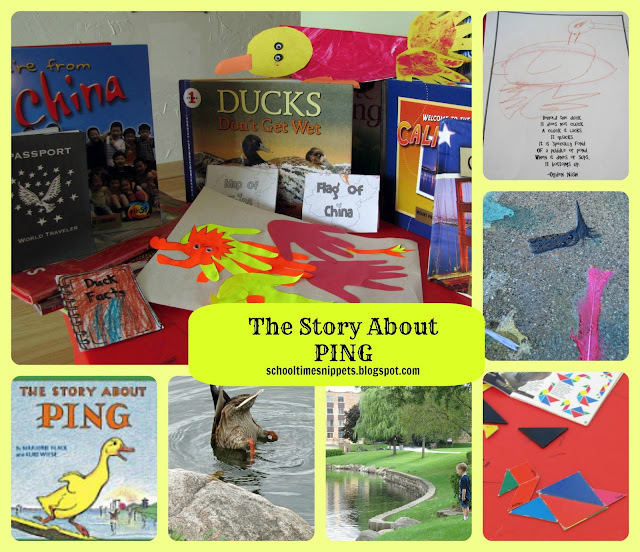 It was an endearing tale about a young duck named Ping, who decided to run away because he did not want to receive his punishment for being the last one on the boat. However, it turns out that running away only presented more dangers! Have you ever tried to run away from taking your punishment? Well, I won't bore you with examples from my life, but learning discernment and that our actions have consequences are great lessons for littles to learn. Calendar time-- we write the day and date and T makes the date in change. Coloring a new Sight Word-- over at 1+1+1=1, you can find color by number sight words. I have modified it since and have my son pick two colors; one is used for even numbers, the other is for odd numbers. He then draws a number (0-9) for each letter, and colors the letters accordingly. We also sing the sight word to the tune of B-I-N-G-O. I don't have a set time for when we read our FIAR book or do the activities, but I try to do them when little sis takes a nap. FIAR is taking a chosen book from the curriculum an reading it everyday, for at least a week, and focusing on one subject area each day. Thus Monday is Geography, Tuesday is Language Arts.... etc. I had packed my son's suitcase with books we would be using for the row and gave him his very own Passport! (Not real, of course!). After we "flew" around the kitchen a few times, we landed in China. We colored the Chinese Flag and found China on our world map. We also talked about the Yangtze River (that is where Ping lived), looked at pictures of the river online, and noted that it is the longest river in China. Math: We completed a worksheet from HSS; my son colored and counted all the ducks in Ping's family. It was great to see how many other ducks Ping lived with! He also did a Duck connect the dots worksheet and played with Tangrams we got from the library. Art: My son made a dragon hand print, learned to draw a duck, and made a paper plate duck. Some of ideas came from Michelle over at Delightful Learning. Thanks so much! Science: Performed a Sink vs. Float experiment and we read a book called, "Ducks Don't Get Wet " and did the experiment in the back. Did you know ducks don't get wet because their feathers are covered with oil!? I am finding I am learning all kinds of stuff, too! We made a Duck Facts booklet from HSS, too. ﻿﻿﻿﻿﻿﻿﻿﻿Other: We watched Learn Chinese with MeiMei and learned how to say "hello" and "how are you". We greeted my hubby with a "Ni Hao" when he got home from work! We also rented a Learn Karate dvd from the library-- learning from a video was rather hard! Not to mention, I was wearing Abby in my Moby. FYI, learning Karate while wearing a Moby wrap does not work! Oh... and in one of our books was a recipe for Egg Custard, which was a complete FAIL! Yuck! But we tried! 50 States Study: We looked at some books about California, found it on the map, and made the California State Flag. It was a great first week!